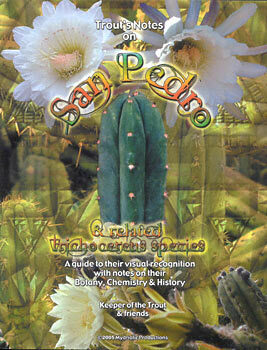 San Pedro includes the cacti known as San Pedro and related Trichocereus spp. Its wealth of photos can assist readers in gaining familiarity and some understanding of this often misunderstood and bewildering grouping of species and hybrids. These large, fast growing, columnar species have been reported to contain mescaline. Several have long sacramental histories; recorded in the assorted chronicles left by the invaders of the "New World" and in ancient Peruvian art spanning millenia of their vibrant and beneficial relationship with humans. This relationship persists even into modern times. Originally released as the Trhicocereus chapter of Sacred Cacti, the text of this edition has been expanded to include corrections and updates along with hundreds of additional photos! San Pedro provides an informative examination of the botanical characteristics, horticultural offerings and points of confusion, sacramental histories if known, published chemical analysis, if any, and reported pharmaconautical applications. It is intended to help both researchers and the reader who is already employing these sacred beings as sacraments & spiritual teachers to better recognize and understand these ancient allies.